If you are a landlord of a rental property, there can be various reasons for you to increase the rent of the rental property. And for doing that, you will have to intimate the tenant or tenants through an appropriate medium. Creating a letter from the scratch on your own, especially if you are not well-versed with the legal terms can be tedious and time-consuming. You can also see Rental Reference Letter Templates. This where our Sample Rent Increase Letter templates can come to your rescue. Through these Letter Templates, you will be able to inform your tenant that you plan to increase the monthly rent of the property. These templates will help you in covering all the necessary information in the letter so that there won’t be any confusion or dispute regarding the increase in rent. 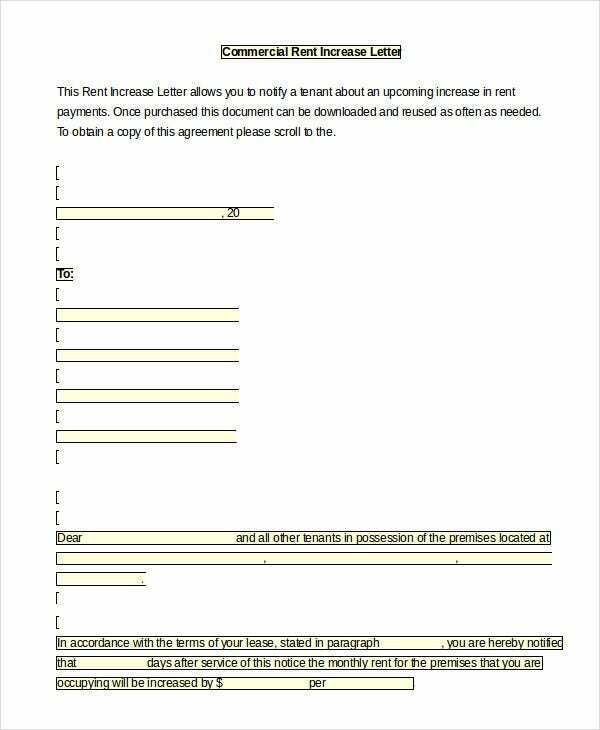 This is a rent increase letter template that can be used to intimate the tenant about the increase in rent. This template contains all the crucial information. You can download this template and use it for your purpose after making the required changes. If you are a landlord of a rental property and need to inform your tenants about an increase in the rent, you can use this letter template. This template is available with a simple format design and is highly professional. You may also like to see the Invoice Template. 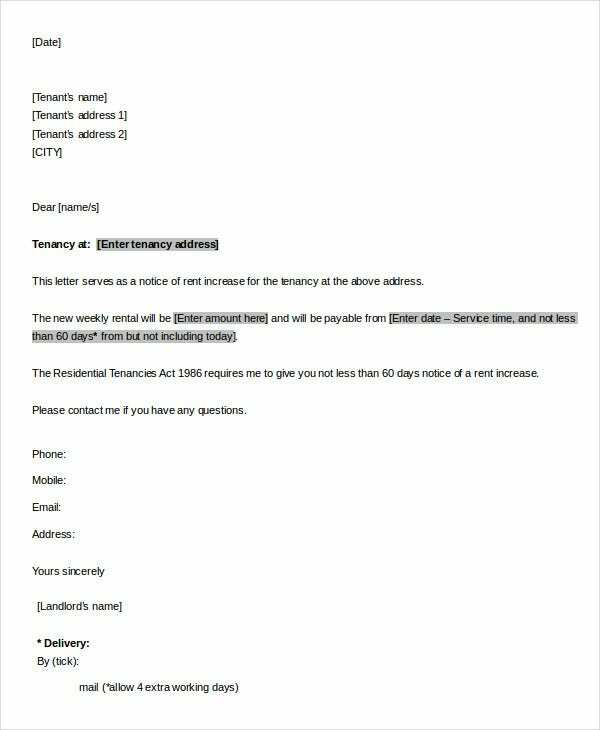 > Who Can Use These Rent Increase Letter Template? 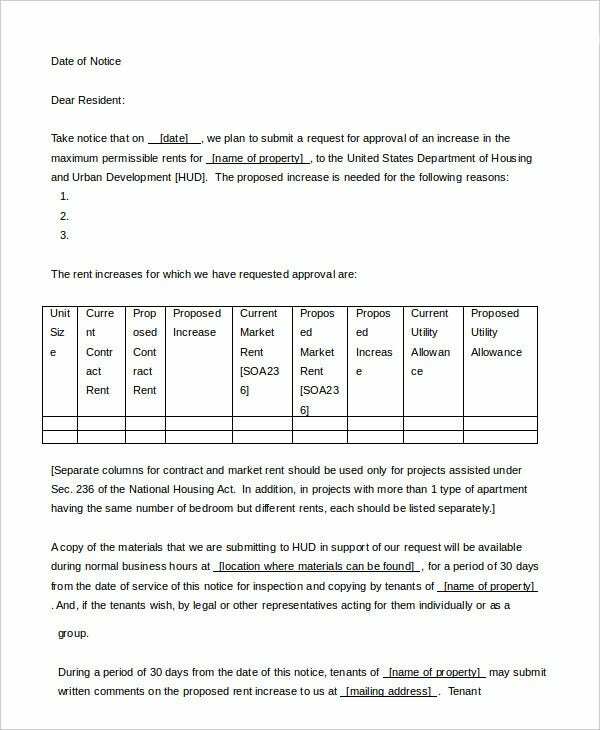 The Rent Increase Letter Templates can be used productively by the landlords or property owners of various residential as well as commercial properties. A landlord decides to increase the rent due to different reason like an increase in property taxes or inflation. You may also see Job Reference Letter Templates. And they should raise the rent at the end of the property lease. They should be honest with the tenants and should explain the exact reason for this increase in rent. Honesty goes a long way in a letter of this nature. The layout of the letter templates contains crisp and professionally written letters that can intimate the tenants about the increase in rent with a polite tone and a professional manner. The use of language in this template can be understood by anybody, and it contains an array of information like what is current rent and what will be the future rent. You can notify your tenants about the increase in rent through this letter template. If you are the owner of a commercial property and want to intimate the tenant or tenants about the increase in rent, you should use this letter template which will help you in passing on the message in a professional manner. 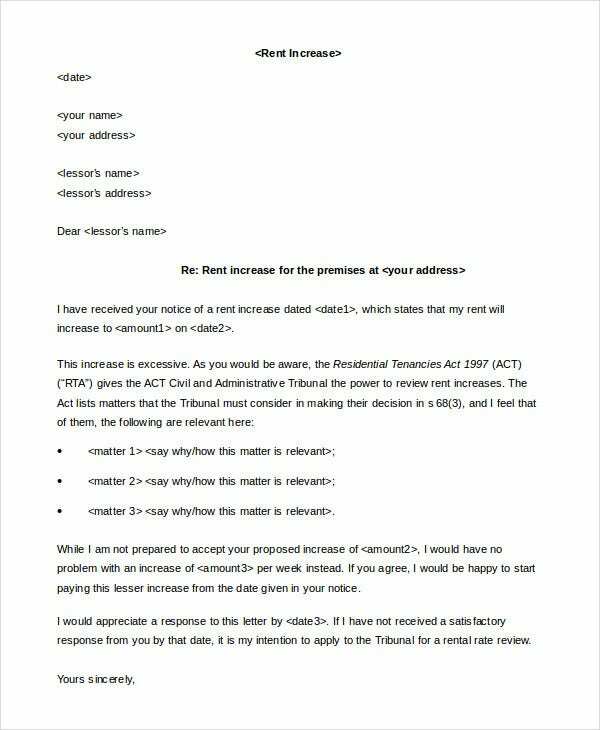 This Sample Letter for Rent Increase template will assist you in communicating to your tenant about the possible increase in rent in the most appropriate manner. The professional language used in the template will make the process of communication a smooth one. 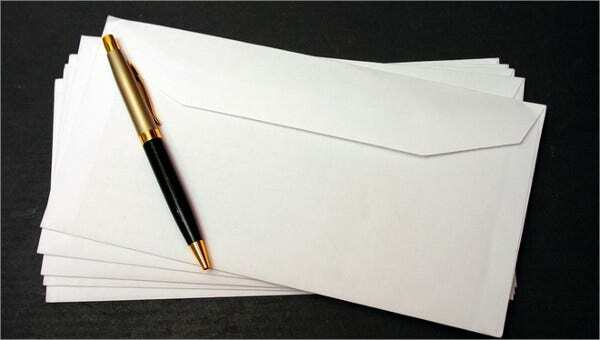 > What Are The Advantages of Sample Rent Increase Letter Templates? The relationship between a tenant and a landlord is a delicate one and matters like intimating the tenant about an increase in the rent should be delicately handled. To have a happy tenant, the landlord and tenant must communicate well. 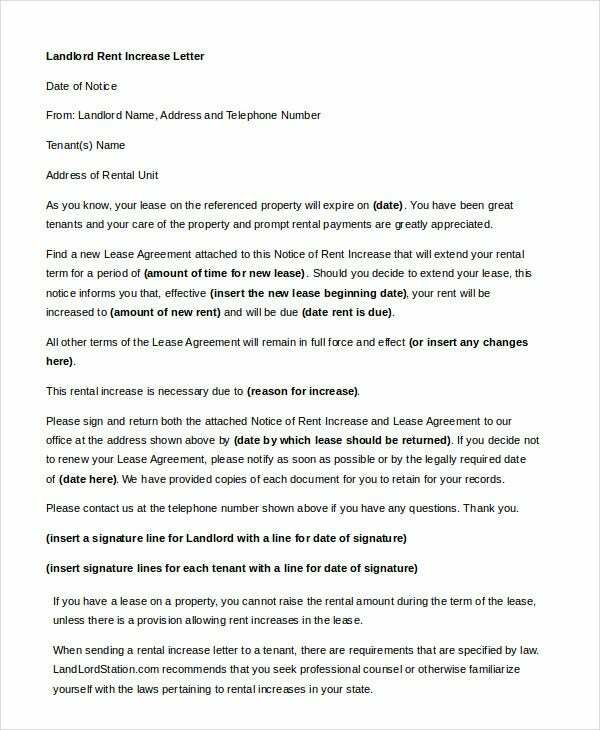 You can also see Rental Agreement Letter Templates. Using a Rent Increase letter is the ideal way to proceed further with this task. The letter needs to be carefully worded so that it doesn’t end up hurting the sentiment of the tenant. You can use these letter templates directly after downloading, or you can draft an entirely new one on your own after going through the various letter templates.They are written by our team of experts who have written them after a thorough research on this topic. Such templates are a blessing in disguise as you don’t have to do everything on your own from scratch.